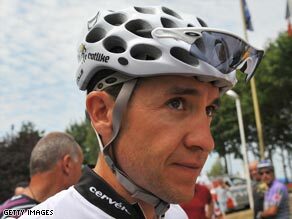 Defending Tour de France champion Carlos Sastre has exclusively told CNN that he does not care what happens in the alleged dispute between rivals Lance Armstrong and Alberto Contador at Astana — and is only concentrating on retaining his title. The 34-year-old Sastre goes into the second week of the race seemingly with a tough task to win his second successive Tour. He is 16th in the general classification, 2:52 behind current race leader Rinaldo Nocentini but more significantly 2:46 off second-placed Contador. “I am in good form, although I wouldn’t say I am in great form,” added Sastre, who traditionally comes good in the latter part of three-week stage races. “It is clear that Astana are the strongest team and they can ride at the front of the race, dictating the pace of the peloton. But I know what I must do and the race will be decided in the Alps and on Mont Ventoux in the final week.” Last year Sastre benefited from neither Armstrong nor Contador being in the line-up but despite their presence in this year’s race, he will not be happy with anything other than another victory. “After winning last year, what else can I do this time If I am on the podium it will mean nothing because I have finished first before. Nothing else really matters to me — so it is win or bust. I have to ride my own race — I know what I have to do to win again.” CNN also caught up with Astana rider Levi Leipheimer on the rest day. The American is fourth in the overall standings, just 39 seconds off the lead, but has been largely ignored while the battle for supremacy rages on between Armstrong and Contador. “Our team is very strong and I think either Alberto or Lance will definitely win in Paris. At the moment I would say Alberto is the stronger rider, he is far more explosive in the mountains and will probably try to win the race that way.